Liczba stron: 455 Jest to ujednolicona liczba stron, która ułatwi Ci porównanie długości książek. Każda strona Legimi to 200 słów. Illustrations in this ebook appear in vibrant black and white on ebook reading devices.Three children embark on an epic journey to save their kingdom...High Queen Rhiannon Eldess has placed the kingdom of Kaldan under a terrible curse. Only Kòdobos, Anyr, and Laris can save their people from a dark fate. Danger awaits the children as they face the queen's evil minions in their desperate quest to save their kingdom.To gain final victory the children must find Witch Bane, the magic sword which will give them the power to defeat Rhiannon once and for all! But a prophecy foretelling of the return of an ancient evil threatens to doom them all. It will take all their courage to survive the malevolent forces of evil gathered against them. Will they fail or will they succeed? Prepare for the adventure of a lifetime! This is a work of fiction. The events and characters described herein are imaginary and are not intended to refer to specific places or living persons. The opinions expressed in this manuscript are solely the opinions of the author and do not represent the opinions or any third-party publishers. Cover Art © 2013 Annette Tremblay. All rights reserved – used with permission. Illustrations © 2007 Karen Petrasko. All rights reserved – used with permission. This ebook is licensed for your personal enjoyment only. This ebook may not be re-sold or given away to other people. If you would like to share this book with another person, please purchase an additional copy for each person you share it with. If you’re reading this book and did not purchase it, or it was not purchased for your use only, then you should purchase your own copy. Thank you for respecting the hard work of this author. The Legend of Witch Bane was first published in January 2008. It was my debut novel and the book that introduced readers to the world of Arva. 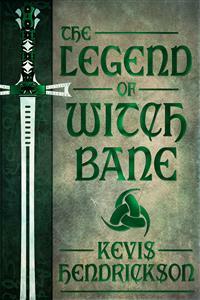 In spite of a few missteps, The Legend of Witch Bane was well received by readers. I’ve since desired to produce a new edition that reflects my updated vision of the story, not the least of which was to correct the ages of the protagonists, as well as address some other minor issues that went unattended during its initial release. Although several years have passed since its publication, and far more than I had originally intended, I have never abandoned the series. The re-release of this book signals the impending arrival of its long delayed sequel, which goes unnamed as yet. It’s with great pride that I present this new and improved version of The Legend of Witch Bane. It has long held a very special place in my heart. I hope it will find its place in yours as well. Once there was a boy who had two sisters. His name was Kòdobos, and the names of his sisters were Anyr and Laris. They were the children of a mighty king and queen who lived long ago. Now Anyr, who was the youngest of the children, was thoughtful of her brother and always had his welfare in mind. But Laris, who was the oldest, was unhappy with Kòdobos. Some said it was because she was his half-sister and came from the land of fairies where little boys were thought of as silly creatures. But perhaps she was simply jealous of all the attention her brother got, being that he was to become king one day. This is the story of how a family was nearly destroyed because of terrible lies, and how an evil queen threatened all that was good in the kingdom of Kaldan. It is also the story, I might add, of heroes, and of villains, and of great battles fought long ago. It is The Legend of Witch Bane. It was a coldish day and rainy, and Anyr wished she were home under the warm covers of her bed. She was shivering and upset that her scruffy fur coat did little to keep her warm. She would probably catch a cold. But growing ill was the least of her worries, for a far more pressing matter was at hand. By the powers vested in me, I, Caldor, Minister of Affairs and royal executor to her majesty, Rhiannon Eldess, High Queen of the Northern Realm, hereby summon ye, noble stewards to the throne of the kingdom of Kaldan, King Krüge and Queen Yvora Falinn, to a public gathering at hereby invitation. For to avoid further hostilities on account of prior wars levied against Queen Rhiannon, their Excellencies are counseled forthwith to satisfy the conditions of her said majesty’s treaty by which ye and your subjects are bound. By provision of this lawful institution, their Excellencies shall hereby provide tribute to her said majesty on the sixth day of every fourth month of the year. In addition to quarterly tribute of no less than one half of all acquired taxes made of Kaldan’s citizenry, their Excellencies must yield as payment to her said majesty ten of their youngest female citizens so as to maintain amity between respective parties. On said date on which summons is to be held, their Excellencies shall form assembly of their subjects for public display of all female citizens currently under the age of fifteen, not withstanding of, or excluding, those of royal office or servitude. Save only for grave illness or death impending, no exceptions shall be made to the attendance of hereby summons. A registry of all Kaldan’s citizens, including their Excellencies’ heirs, shall be made privy to said Minister of Affairs so as to execute her said majesty’s royal wishes. Compliance to these orders shall result in a continuance of suspension of aggression against Kaldan and its respective citizens. Correspondence to their Excellencies given on this sixth day of the eighth month of the thirteenth year of the rule of Rhiannon, High Queen of the Realm. Now that he had delivered his edict, Caldor gave instructions to the knights in his charge to scour the assembly. One by one, all the young girls were forced into a huddle in the middle of the castle square. There was much shoving and weeping as Anyr was forced into the ranks of the young girls. She was frightened, but knew she had to keep calm. Anyr had not been allowed to stand with her family during Caldor’s reading of the royal decree. But as this was not the first time Anyr had attended one of these summons, she knew her parents were trying to protect her. For if she had been allowed to stand with her family, she would immediately have been identified and selected to go off with Caldor for some imagined transgression between her parents and the High Queen. At least that was what she was told. However, it did surprise Anyr to find her sister Laris standing beside her. Laris must have noticed that she was afraid, for she took Anyr’s hand and squeezed it. Anyr remembered asking Laris the night before why the High Queen wanted to take the young girls away from their families. Laris simply answered that the High Queen was an evil woman who did terrible things to the girls she captured. Laris did not explain to Anyr what those things were, but Anyr knew that she did not want to be taken by the High Queen’s henchmen. “Before the selection begins, I must know from their Excellencies if they have complied with the summons,” said Caldor. “On your word that no more than ten girls of rightful age are to be selected to become your prisoners, my wife and I have complied with the summons and placed our daughters within the gathering in the castle square,” said the king. No sooner than he had made his threat, Caldor unveiled from his cloak a small glass orb. Anyr could see her mother grow pale with fear. The fact that Caldor was going to select which girls would go with him to the castle of the High Queen was dreadful enough, for rumor had it that he was a sorcerer. That he was also going to use some magical device to seek her and her sister out from among the assembly of girls was more than Anyr’s little heart could take. Minutes seemed like hours as Caldor searched for unwilling victims. Every now and then his cheeks reddened with delight as he felt himself drawing nearer to the king’s daughters. One after the other, Caldor selected which girls were to be taken to the High Queen. Anguished cries could be heard coming from the crowd as distraught parents watched their daughters become his prisoners. Finally, the moment came when all but one girl was chosen to complete the number of those who were to go off with Caldor. Anyr watched as Caldor approached her and her sister. Suddenly, Anyr remembered the magic gem she had in her coat pocket. Laris had given it to her the night before and told her that it would keep her safe during the summons. Would it really save her life? Anyr clutched the gem tightly in her palm wondering what would happen now. It seemed at that moment that all was lost, and that poor Laris would have to go with Caldor to an undesirable fate. But Anyr could not allow her sister to be taken. While Caldor contemplated whether or not to take Laris as the final girl, Anyr secretly dropped the magic gem into her sister’s coat pocket. Immediately, Caldor’s orb ceased to glow. Laris said nothing, but watched Caldor with hateful eyes. Indeed, thought Anyr, Laris was very much like their father with such courage. Finally, Caldor’s eyes reached Anyr. Anyr let out a shriek when Caldor suddenly took her into his iron grasp. “Too long has your father protected you from the sleepless eyes of the High Queen, little one. But no more! It is done!” cried Caldor, holding aloft his magic orb so that all could see its blinding glare. Another loud shriek came from the direction of the dais where the king and queen stood. The queen was wailing frantically. The king could hardly restrain his wife from flying from the dais to come to Anyr’s rescue. “Only one daughter remains, King Krüge. And she, too, shall learn most piteously the grim fate that awaits her sister here,” said Caldor. “Must you take away from me my very flesh and blood? She is but a child!” cried the king. “Child-eater! I will not let you take my daughter away!” cried the queen, still trying to rip herself free from her husband’s grip. “We shall not oppose you, Caldor. But some day this evil you have committed against my House in your wicked queen’s name will have to be paid for,” said the king, overcome with tears. No sooner than Caldor spun around with Anyr in hand to join the ranks of his knights and the rest of the captive girls, Laris suddenly lunged after her. So fearful was Laris of losing her young sister that it took more than one of Caldor’s knights to stave her off. Laris might have incurred the lethal anger of Caldor’s knights had her brother Kòdobos not forced his way through the incensed crowd from the dais to restrain her. “Don’t worry yourself, young princess. I will return for you,” said Caldor, his eyes trained on Laris. Angrily, Laris snatched herself free from Kòdobos and watched helplessly as Anyr was led away from them. Poor Anyr’s screams were drowned out by the lament of the irate crowd that sobbed over the young girls now stolen from them. Night fell and the moon rose to cast its glorious golden gaze upon the kingdom of Kaldan. There was an uneasy meeting in Princess Laris’ chambers as she held converse with her brother Kòdobos. He had seen all that unfolded earlier in the castle square, unable to do anything to help Anyr in her moment of need. Hence, he had stolen into his sister’s chambers to speak with her about what should be done. “We can’t pretend like it didn’t happen,” said the young prince. “Well, what do you suppose we should do?” asked Laris. “Say what you like. I’m not going anywhere. That’s final!” said Laris, spinning her back to Kòdobos. There was a grave silence after Laris spoke. Kòdobos stood dumbfounded by his sister’s words that had pierced him deeply in the heart. Wordlessly, he turned around and left Laris alone in her room. She watched him with a vicious glower, offering no kind words to ease his departure. For all she knew, she would never see Kòdobos again. Was this how she wanted them to part ways? Laris didn’t stay long in her chambers. She couldn’t sleep and was upset over the hot words she’d had with Kòdobos. She had decided to take a stroll through the hall near her chambers when she saw, staring out of a nearby window, her father looking as tall and as grim as she had ever seen him. King Krüge Falinn turned to see his approaching daughter and watched the way the moon’s glow shone brightly about her. “It is late, Laris. You should be asleep,” said the king. “I can’t sleep,” replied Laris. “Nor can I,” said the king with a sigh. “I miss Anyr,” said Laris. “I won’t always be a girl, Father. Neither am I afraid of the truth,” said Laris, as if to remind her father that he sometimes forgot that she was nearly grown up. There was a moment in which both father and daughter held back from speaking, as it seemed either of them might succumb to tears. And then Laris found her voice once more. “What else grieves you, my dear?” asked the king, noticing the deep sadness in his daughter’s voice. “Those are harsh words, Laris,” replied the king, setting his grim gaze on his daughter to see the tears welling in her eyes. “Yes, Father. Good night, Father,” said Laris. “Sleep well, Laris,” said the king. Silence crept into the cold hall as the king watched his troubled daughter return to her chambers. The wind howled. The willows shook. The leaves, a gay river of ruddy gold and orange, whipped through the air as Kòdobos made his ride under the waxing moon. Such was the cold of late autumn that the young prince’s knees knocked under his greaves while his teeth chattered. His gray shield was slung loosely over his shoulder and rattled noisily against his hauberk during the mad gallop of his horse, Amaxilfré, whom he had stolen from the royal stables while the stable guards were not looking. Kòdobos was a boy, no older than eleven years of age. That he was willing to brave the dangers of the night to save his sister was less from courage and more out of desperation. Ultimately, it was love that moved him most. Unlike Laris, who had grown up quickly because of her faerie blood, Anyr was very small for her age. Kòdobos knew she could not protect herself. While Laris was hardly more than a stranger to him, he had known Anyr from her first day of birth. She was the most beloved of his sisters and the one he felt obligated to protect. If only his parents could see him now! They might very well have clutched him to their breasts for love of his act, as strangle him for disobeying them. But what else could Kòdobos do other than what he was doing now? He was not about to let some evil queen steal his little sister from him because of some silly old treaty. As far as he was concerned, there was an even greater treaty, an unwritten pact between siblings that no document, or army, or royal decree could ever break. Anyr was his flesh and blood. That was worth more than all the ink and parchment in the world. It was when Kòdobos noticed a slew of lights glaring up ahead in the woods that he knew he had come to the camp of the High Queen’s knights. He quickly dismounted from Amaxilfré and fastened her reins to the gnarled branch of an old rowan tree. Afterwards, he did his best to make a noiseless approach to the campsite despite the awkward weight of his armor. He gazed through sagebrush to observe the camp. There were all the knights he had seen earlier in the day, about fifty in number, all fast asleep. If ever he had a chance to rescue his sister, now was the time. Kòdobos went quietly into the camp and hastened through the shadows of the trees in front of him, flying from pavilion to pavilion, trying to guess which one held Anyr prisoner. There was a pavilion in the center of the camp that was guarded by a ring of knights. Kòdobos wondered if this was the place where the enemy had brought his sister. There was only one way to find out. He would have to enter the pavilion. Fortunately, the knights were asleep. Wasn’t it strange though? As odd as it was that no one was awake to guard the pavilion, Kòdobos would not frown upon his good luck. With careful steps, he made his way to the pavilion unchallenged. However, there was a rather beastly looking hound with two heads guarding the entrance to the pavilion. The hound was as fierce-looking as any Kòdobos had ever seen. He knew that if he were to try to get by the hound, he would be torn to shreds. And if the hound didn’t get him, he would certainly be in trouble when all the knights woke up from the hound’s loud barking. There had to be a way to get past the hound. Kòdobos looked around the camp with a curious gaze. His eyes suddenly grew wide. There was a frying pan nearby with a large bone in it. Kòdobos removed the bone and hurled it at the hound. The hound snapped up the bone into its slavering maws before the other head ravenously devoured its share of the meal. Kòdobos made a hasty, but careful approach at the hound, and soon found himself inside the pavilion unnoticed. It was dark inside, but Kòdobos could make out the shapes of several young girls sprawled on the floor. These were the girls that had been taken from their parents during the summons. Kòdobos could only imagine what horrible fate awaited them, but he knew he could not save them all. Kòdobos searched the girls and found Anyr sleeping on a filthy little blanket. He put his hand over her mouth and roused her from her sleep. Immediately, Anyr’s eyes went wide when she saw her brother’s face. He beckoned her to remain quiet while he used his dagger to cut the rope that held her hands pinioned behind her back. No sooner than her bonds were cut, Anyr hurled herself against Kòdobos and squeezed him. “Oh, Kòdobos! I thought I would never see you again! How I missed you!” she said. However much it grieved Kòdobos to leave the other girls behind, he knew it was too dangerous to wake them all. He would have his hands full just trying to get Anyr safely out of the camp. Not wanting to risk passing by the hound again, Kòdobos made a cut in the side of the pavilion with his dagger and escaped with Anyr to the rear of the camp. Fortunately, the guards were still asleep. A short while later, they reached the old rowan tree where he had tied Amaxilfré. However, the mare was missing. “Amaxilfré’s gone! Someone must have taken her!” cried Kòdobos. “Or set her loose!” suggested Anyr. “Either way, we’ll have to go it on foot now,” decided Kòdobos. Just then, the children heard something strange on the wind. It was a voice as mysterious and enchanting as the dark woods about them. “Do you hear it?” asked Anyr. “It frightens me!” said Anyr. “Me too. But we have to keep going!” urged Kòdobos. With every step they took into the woods, Kòdobos grew more frightened. He began to fear that he had made a grave mistake by coming to save Anyr. Who knew what the High Queen had intended for her? Perhaps she wasn’t so dreadful a woman as he had heard and would have been kind to his sister. On the other hand, he was risking not only his own life, but Anyr’s as well. By now, the moon had disappeared behind the clouds, and the night had grown so dark that the children could barely see the way before them. The trees loomed ever closer to them the further into the woods they went. Soon there was no doubt that the trees were trying to cut off their retreat. Such was their danger that every few minutes, Kòdobos had to alter his course to avoid the winding web-work of crooked limbs and shifting tree trunks that obstructed their passing. Through it all, the children could hear the haunting voice on the wind getting louder. For all they knew, they were being drawn to some forbidden place in the woods where some horrible beast had been stirred from its slumber, anxiously awaiting them. “Look! The trees, Kòdobos! They’re moving!” cried Anyr. She had barely gotten the words out of her mouth when the trees heaved themselves forward on their wide trunks and thrashed their heavy bows at the children. Anyr shrieked, but the trees kept up their rampage. Soon, the children were ensnared in lichen like a pair of flies caught in a spider’s web. Kòdobos drew his dagger and hacked madly at the trees, cutting the lichen that trapped them. But ever did the queer singing continue, surrendering its benign harmony for rampant discord. It was as if the shrieking voice was beckoning the trees to keep up their mad assault. Despite their attempts to keep the trees at bay, Kòdobos and Anyr were both hauled into the air by tentacle-like coils of lichen. Kòdobos squeezed Anyr’s hand, trying not to be separated from her. But the trees cruelly snatched her from him. All Kòdobos could do was to listen to his sister’s wail as she was dragged off into the shadows of the trees while the voice in the wind sang its sad lament. When Kòdobos came to, he was lying in a reed of tall red grass under a vast wood of trees. He rose slowly from the ground and tried to get a good look at his surroundings. There he saw a ring of stones encircling him, and beyond that a willow tree, the largest he had ever seen. He realized that he was in a glade, but it was dark and foreboding, and not the kindly glade that he was used to having picnics in. When he took a step toward the tree, he felt the wind blow roughly against him. It was not the kind of wind that was typical of the year, for all at once it was both hot and cold, and there seemed to be a fell voice on it. “Who are you?” asked Kòdobos, attempting to peer into the darkness to see from whence the voice came. “I am she who has awakened,” the voice answered. “Where is my sister?” the young prince asked, still not certain who he was talking to. Now it was that Kòdobos looked across the glade and saw standing there Amaxilfré, his trusted mare whom he’d had many adventures with. He flew to her and mounted her saddle, knowing that he had to act with all haste or lose forever the sister he loved. “You must hurry, else the night shall claim your sister’s life,” urged the mysterious voice. And with that final warning, Kòdobos was off. It took some time for Kòdobos to find his way home and into his father’s chamber. There his mother lay beside his father, sleeping in bed as soundly as they could despite the day’s trials. Kòdobos might not have thought either of them asleep, but that they had so grieved the loss of Anyr that it had taken the very strength from them. For a moment, Kòdobos observed his parents, glad for the respite they gained in sleep that they did not have in waking. He would bring them joy again. He would make certain that his parents would be reunited with their youngest child. Kòdobos would not see the night end in futility, even if he had to take from his father the very sword that had made him the most feared king in the realm. It was nothing he desired to do, but he had no choice. It was either deprive his father of his beloved sword or forfeit the life of Anyr. Now having discarded his weighty hauberk to reveal a sleeveless overcoat of royal blue, Kòdobos stole across the room and found the scabbard in which his father’s sword was sheathed. Kòdobos removed the weapon, scabbard and all, and retreated from the room, taking one final glance at his parents before leaving them to their quiet slumber. The ride back to the woods where Kòdobos had lost Anyr was no less desperate than the one in which he left her to her fate. But it was by no means safer. By now, Caldor’s knights had discovered the escape of Anyr and were galloping to and fro through the woods in search of her. Many times Kòdobos thought he would have been found out and captured by the knights, except for his shrewdness (not to mention the swiftness of Amaxilfré’s light-footed gallop). But each time he had to go into hiding to avoid being seen, he lost more of the precious time he had to save Anyr. Even now, Kòdobos could see the red glare of dawn reaching up into the sky over the horizon. It was during the last hour of night that Kòdobos finally made his way back to the glade where his sister was taken from him. After dismounting from Amaxilfré, he hastened into the circle of stones near the large willow tree. “I did what you asked of me!” cried Kòdobos. “Then bring forth the Sword of Kings,” the mysterious voice said to him from the recoiling shadows. Kòdobos did as he was told and presented his father’s sword. There was little hesitation in Kòdobos’ movements. And yet something disturbed him about what he was doing. “Place the sword into the center stone,” said the voice impatiently. Only now that the sun was beginning to rise did Kòdobos notice a stone lying within the center of the circle of stones through which it appeared that the blade of a sword could be placed. He quickly performed the act as the voice intended, and felt the sword immediately being drawn from his hand. The earth shook beneath his feet as a dais made of stone began to rise from the blanket of leaves that covered the ground. Now it was that Kòdobos noticed something odd. He removed his gaze from the sword that was held fast into the earth and looked behind him to see the bright glare of the sun. Only it was not the sun, but a black sphere in the sky where the sun should have been. It was an eclipse. “You have done well, young prince. Now receive your reward,” said the voice. Kòdobos spun back around to see an altar of stone in the center of the dais on which lay his sister covered with many leaves. Fearing that his sister was dead, Kòdobos flew to her and took her into his arms. “She is sleeping,” said the strange voice. Only this time, Kòdobos could see who it was that was speaking to him. Just a short ways from where he was standing by the altar, he noticed a woman, as beautiful as any that had ever lived, donned in a raiment of white with long flowing hair that was fairer than white gold. “Your courage this night has won the life of your sister,” said the beautiful woman. “I love her, my lady,” replied Kòdobos, forcing the words out of his mouth. “Indeed. For love is the very same power that has summoned me from my long slumber,” the beautiful woman explained. “I’m afraid I don’t understand,” said Kòdobos. “I have to go to my parents. They will worry about me,” said Kòdobos, not really understanding anything the beautiful woman was saying to him. “What shall I call you, my lady?” asked Kòdobos, still not sure what the beautiful woman was talking about. Even if Kòdobos had known on that fateful dawn who or what it was he had unleashed from its slumber, he would scarcely have been able to fathom what was to come. All that concerned him now was that he had managed to save Anyr from a most terrible fate. That thought alone kept his fear and love of the beautiful woman from growing any more than it already had. Laris paced nervously along the checkered marble floor of the Throne Room where her stepmother and father were conversing with their lords. It seemed to Laris that the night before just might have been the longest night of her life, a night in which she had probably lost both a little sister and brother. The fact is, Laris had slept very little even after her father’s prodding, fearing that some calamity might befall Kòdobos. The worst part was that she knew she could very well have gone to his aid. Laris, however young, was by no means helpless. She was born of two worlds, that of both human and faerie, and had been raised from a small child in the ways of both peoples. As she was only half human, she had powers the likes of which her family could only fathom. And yet, she had refused to lift a finger to help either Anyr or Kòdobos. By now, she had grown perturbed over her lack of action the night before and could hardly forgive herself. What if Kòdobos really did die in his quest to help Anyr? That she had turned her back on him when he needed her most could only bode ill for her. “Why must his majesty persist in refraining from taking action against those who have committed us the gravest injury?” asked Enser Haydn, the king’s lord marshal. “Because trouble would certainly come of it,” answered the king. Before anyone else could have their say, the queen, who up to this moment, and since the kidnapping of her daughter had not spoken even once, now offered her thoughts to the king. Such was the passion of her plea that none present could hear her words and not be affected by them. “And for our folly we would only bring forth the destruction of Kaldan,” the king argued. It was obvious to all who beheld the passionate exchange between the king and queen that the king’s mind was set. For he had the final say in declaring war on the High Queen. And he was determined not to risk the lives of the people of his kingdom on what he felt was an exercise in futility, however personal its cause. “Perhaps that will not be Anyr’s fate,” said the king. The queen had no sooner begun to grieve for her daughter than a small child’s voice suddenly hailed from the front of the chamber. All at once, the king and queen, and all their servants and nobles and knights saw, running toward them, the little princess Anyr. There was such a clamor in the chamber! Casting aside all court etiquette, the king and queen flew down the steps of the dais upon which they were standing and embraced their child. “Oh, Anyr! You are safe!” cried the queen. Anyr kissed her mother and father and wept. Laris also came flying across the chamber to hold her sister. “Oh, Laris! I missed you so much!” said Anyr. “And I, you, sweet little sister!” said Laris. There was such merriment in the chamber that scarcely anyone noticed Kòdobos approaching down the aisle in his sister’s wake with reluctant steps. “How is this possible? How did you escape Rhiannon’s knights?” the king wanted to know. “Kòdobos came for me and took me away from the bad people!” answered Anyr. Then it was that the king and his wife, and Laris as well, noticed Kòdobos walking slowly toward them. He was troubled, and even the king lost some of his joy for seeing his son so glum of spirit. Anyr was swept up into the arms of her mother as they observed Kòdobos. “Are you hurt, Kòdobos?” asked the king, noticing several bruises on Kòdobos’ face. “No, Father,” answered the boy. “Would you care to explain yourself?” the king inquired further. It was clear that the king was as upset as he was curious of the events that had saved Anyr. But before he could reveal his anger at Kòdobos, the queen interjected on their son’s behalf. “Go easy on him, Krüge. Our son has risked much for us all,” admonished the queen. “I daresay he has risked much indeed to save Anyr. But it will have to be paid for,” the king replied uneasily. “I know you wouldn’t have approved. You would have stopped me,” said Kòdobos. Then it seemed that some of the king’s anger was appeased, and his features grew less harsh. Having said what he needed to Kòdobos for the time being, the king spun back toward Anyr and embraced her once more. Kòdobos, meanwhile, noticed Laris observing him closely. He was about to leave for his chambers when Laris hurled herself against him and squeezed him as hard as she could. “I am glad you are safe!” she said. Kòdobos returned his sister’s smile. No further words were shared between them, nor could there be, for at that moment the doors to the chamber were thrown open. In stormed several of the High Queen’s knights, along with the man everyone knew as Caldor. “Unhand that child, now!” he cried, marching forth with such purpose that only the crossed spears of the royal guards standing near the king held him at bay. “Caldor! I had expected you,” said the king. “You have deceived us, King Krüge! You have broken the oath you swore!” said Caldor. “Then it is a good deed,” was the king’s bold reply. “You would dare to oppose the will of the High Queen?” asked Caldor. “I will oppose anyone who would take my children from me!” the king answered defiantly. “She is only one child. You have two others,” Caldor said, his voice taking on a cruel and pitiless tone. “What are the lives of a few little girls compared to those who shall perish in the flames of my lady’s vengeance?” asked Caldor in his most threatening voice. “My daughter stays where she is,” said the king. “Fool!” cried Caldor, lunging forth suddenly to rip Anyr from the queen’s arms. The queen withdrew from Caldor bearing Anyr at her side. A wall of shields, swords, and spears was formed about the queen as the king’s men fell into place to protect her. The evil knights with Caldor drew their own weapons and faced off with the king and his men. “This is your last chance, Krüge! Give me the child!” roared Caldor, attempting once more to take little Anyr into his foul grasp. “Stay your hand!” cried the queen, as she too drew her sword, allowing Anyr to stand safely behind her. The king also reached for his sword, only to remember that he had no such weapon with which to fend off Caldor. It was obvious by the curious look in Caldor’s eyes that he noticed the king’s lack of weapon. “So be it, Kaldanian! If only you knew what is to come of this, you would think differently!” said Caldor in a dreadful voice. “I hereby expel you, Caldor, cruel servant of the High Queen, from my kingdom. For as long as the walls of my castle hold, you would do wise to stay away,” said the king. And with that Caldor marched out of the chamber with his knights closely following him. “It is done. The pact with Rhiannon is no more,” said the king. “You did the right thing,” said the queen.